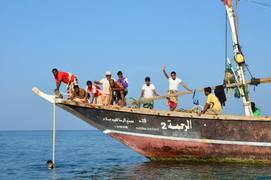 Yemen has a number of islands spread like a string of pearls along its coast; from the numerous small, flat coral-fringed island of the southern Red Sea (like Kamaran), which have developed on salt domes, to the smaller less common island along the Gulf of Aden, most of which are close to the coast and are generally extinct volcanoes thrown up out of the sea during the late Neogene. Some are more distant, fragments of displaced continental crust, like the Socotran Archipelago, which became separated from the mainland about 27 million years ago. 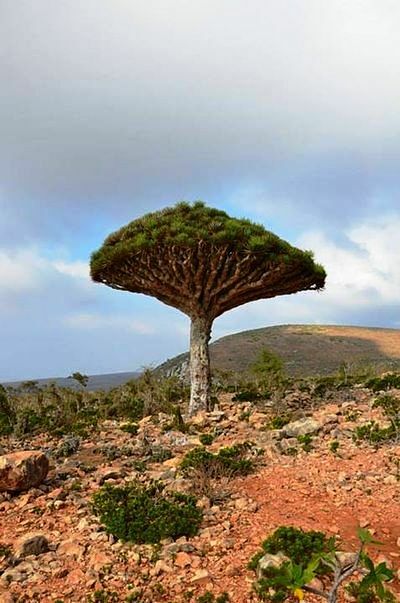 The island of Socotra lie some 190 nautical miles off the southern coast of Yemen, in the Gulf of Aden. Their relative isolation merely hints at their extraordinary foreignness. Like a lesser Galapagos, these islands boast flora and fauna found nowhere else in the world. Moreover, the Socotran people have their own language (which lacks a script) and distinctive culture, cuisine and architecture: neither Arabian or African, yet strongly and distinctively Socotran. Socotra is the largest in a small archipelago of four islands, which includes the Brothers (Samhah and Darsa) and Abd al-Kuri together with two rocky islets that lie in the Indian Ocean on a mic-oceanic volcanic ridge 500 km south-east of Mukalla and 170 km off the coast of Somalia. It is roughly 130 km long and 35 km wide. Its name may be derived from the Sanskrit dripa sukhao ('isle or abode of the blest') or from the Arabic souk qotra, which would mean the market of dragon's blood - a reference to the resin of its most famous tree species. In antiquity it was known to the Greeks of the first century AD as the fabled Island of Dioscorida and described by Marco Polo in the late thirteenth centrury as the Island of Socotra - the market of the dragon's blood. Island of Bliis, Isle of Tranquillity, Island of Mists, Galapagos of the Indian Ocean and the Galapagos of the Arabian Peninsula are just some of the names which have been applied to the island over the centuries. Strategically positioned near the main gateway to the Red Sea, Socotra has been famous since ancient times, and is mentioned in the oldest stories of the world. Gilgamesh of the Babylonian epic passed through the Waters of Death world (the Bab al-Mandab straits) at the southern end of the Red Sea and came here to learn the secrets of immortality from a relative, known as Uta Napishtim. Egyptian knew Socotra as the Island of the Genie - the spirit of the sacred tree, whose gum they used for mummification, temple offerings and medicine. To the Greeks in the first century AD, it was famed for the phoenix, 'the Arabian bird' and locals believe that the oozing cinnabar-like resin of the dragon's blood tree is the result of an ancient myth of the combat between an elephant and a dragon, and the forces of life and death. The island's population, which currently stands at 50.000, consists mostly of shepards and fishermen who speak the unique Socotri dialect. The main population centres are towns along the north coast, such as Hadibu (Hadiboh) - the principal administrative centre; Mouri, with its airport; Ghubbah; Qadheb and the western port of Qalansiyah. The coastal population represent quite mix of backgrounds, consisting of Arabs (Hadrami and Gulf Arabs) who settled here on the islands over 3.000 years ago, as well as Greeks, Africans, Somalis, Mahri tribes, descendants of slaves, sailors, traders and shipwrecked seamen, and other races who have been migrating to the island since the twelfth century. There is alson a Socotri-speaking bedouin population in the interior, who live in the hills, tending their cattle and goats. The variety is hardly surprising considering the island's long and chequered history. Life on the island is controlled by the two monsoon seasons. The south-west monsoons rage from April to October and bring extremely strong, hot and dry winds in from Africa. There is little precipitation and extreme desiccation during these months. The winter monsoon is less severe and blows in the opposite direction from the north-east, and the Indican subcontinent, bringing a little rain, and lasts from November until March. Rainfall is always higher in the mountains than on the more arid coastal plains, but is sporadic, and there are some years when no rain falls at all. Nocturnal dew seems to be far more important to the water supply than monsoonal rain, especially in the high altitude mountain belt where the mountainous cloud yone provides ground water and running water for the entire island. The coastal plains tend to be sub-desertic and are colonised by deciduous shrubs principally Croton socotranus, euphorbias, cucumber trees and Ziziphus spina-christi, but the foothills of the mountains contain a shrubby landscape with incense trees and more bizarre bottle-trunked trees. Socotra, it has to be said, is sparsely vegetated, but pockets of verdant vegetation survive the desiccating summer winds in sheltered valleys or in the high mountaains. Due to the island's isolation, an the fact that human activity has been kept to a minimum, about 37 percent of the flora is unique to the archipelago. Not surprisingly, the vegetation on the island is of great interest to botanists. Over 825 species of plant have now been recorded, and around 307 exist nowhere else in the world. This makes it on of the richest island floras in the world, and Socotra has even been described as the Galapagos of the Arabian Peninsula. The fauna on the island is equally remarkable, 90 percent of its land snail species do not occur anywhere else in the world. 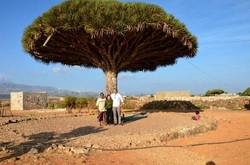 The dragon's blood tree, Dracaena cinnabari, is quite widespread in evergreen woodlands over the centre and east of the island and is the dominant tree in some areas. Some grow to over five hundred years old but are failing to regenerate and are listed as vulnerable. The tree grows best in areas affected by mists, low cloud and monsoon drizzle. A major cause of its decline is likely to be climate change, rather than goats on the island, which have already been there a long time. In an attempt to allow economic development on this unspoilt island where for centuries the islanders have lived in harmony with nature and preserved a unique, traditional way of life, the government, international companies and donor agencies are trying to ensure its survival by improving the lives of the people but at the same time conserving its globally significant biodiversity. 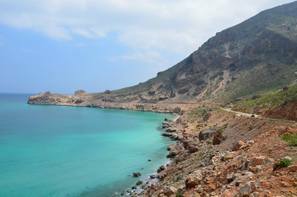 Organisations involved include the Yemeni government's Socotra Conservation and Development Programme (SCDP), which co-ordinates government and donor initiatives affecting the people, and has developed a zoning plan to ensure the survival of the main habitats and plans. 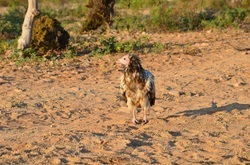 Other organisations such as the Friends of Soqotra and the Socotra Conservation Fund contribute massively to this effort and are devoted to studying and conserving the island's resources. 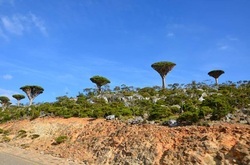 Socotra is a remote naturalist's paradise, which ecotourism offers a way of seeing. A fromula of managed eco-friendly tourism has been developed to help generate incone from visits to protected areas such as nature sanctuaries, national parks and areas of special botanical interest which encompass about 75 percent of the total land area. This is an alternative Galapagos - an untouched, unique ecosystem - with pristine beaches and idyllic oases rarely visited by tourists. The Diksam plateau in the centre of the island is the base and starting point for trekking in the high Haggier Mountains with its stunning scenery and dragon's blood forests. From here the ascent of Jebel Skand (1600 m), currently the highest mountain on the island, is achievable, although strenuous, butis rewarded with spectacular views of the north coast and Haggier Range. The high point, of any visit to this areas is Wadi Da'arho, a deep water-cut canyon filled with massive rusty-coloured andesitic lavas, crammed full of luxuriant palm groves and freshwater pools for bathing and picknicking, high up on the Diksam plateau in the shadow of the Haggier Mountains. 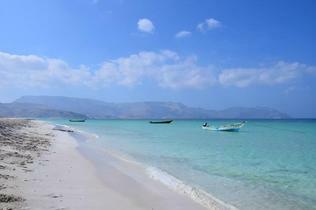 Socotra offers also Homhil and Ras Dihamri Marine protected areas. Homhil has special plants and succulent trees including mature stands of frankincense trees, Boswellia. 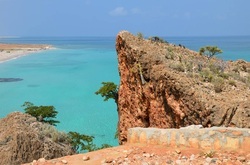 Ras Dihamri Marine Protected Area in northeast Socotra the seas of the Socotran Archipelago still remain in a largely pristine state with spectacular areas of hard and soft corals totaling over 283 species including branching Acropora. In 1998 the WWF designated Socotra as one of the 'Global 200' most important ecoregions on Earth. By 2003 it was recognise as the first UNESCO Man and Biosphere Reserve in Yemen and as one of the best preserved island ecosystems on the planet. It is hardly surprising, then, that in 2004 it was nominated as a potential World Heritage Site. Then at the 32nd session of the council on July 8, 2008 the Socotra Archipelago was finally added to UNESCO's World Heritage List.